The Nile is as central to life today as it was to the fishermen and farmers depicted in the Pharaonic tombs that are dotted along its banks and valley. 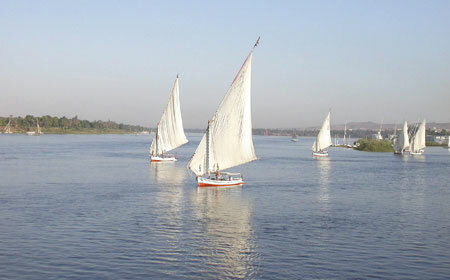 Flowing for 6.690 kilometers, the Nile is the longest river in the world. Beginning at Lake Victoria, the Nile flows through nine countries in total (Uganda, Sudan, Ethiopia, Zaire, Kenya, Tanzanian, Rwanda, Burundi and Egypt) before finally emptying into the Mediterranean Sea. For decades, visitors have flocked to the Nile Valley to stare in wonder at the many treasures that have been excavated there. Most of the ancient monuments were rediscovered after being buried for centuries under the sand and, as a result, have been preserved in amazing condition. 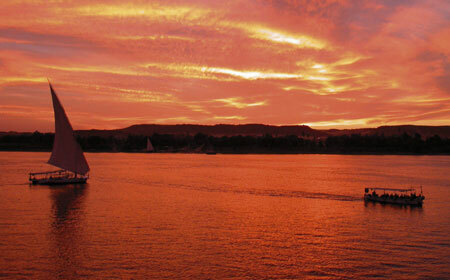 In addition to the magnificent monuments, the Nile itself is part of the region’s attraction. The multitude of feluccas, with their distinctive sails, are as much a part of the landscape as the breathtaking scenery itself.